Woking secured their 3rd win of the National League South season after a topsy-turvy 90 minutes against obdurate opponents Oxford City. Whilst the result will gladden the hearts of Cards fans everywhere, in truth this was a somewhat laboured display from Alan Dowson’s side, who will probably perform better at times during the course of the campaign and fail to claim all three points. Coming into this match looking to win their first three matches of a season for the first time since before the fall of the Berlin Wall (1989), the Cards made one change from the starting line-up on Tuesday night, with Reggie Young being rewarded for his two exciting cameos with a full debut, replacing Nicky Wheeler on the left hand side of midfield. Kicking off attacking the Kingfield Road End in mercifully cooler conditions than a week earlier; Dan Spence, Ian Gayle, Nathan Collier and Josh Casey lined up in a back four ahead of Berti Schotterl in goal. Kane Ferdinand and Christian Jolley provided a central midfield platform for the more advanced Greg Luer on the right, Reggie Young on the left, and Max Kretzschmar through the middle, with Jake Hyde operating as a lone striker. 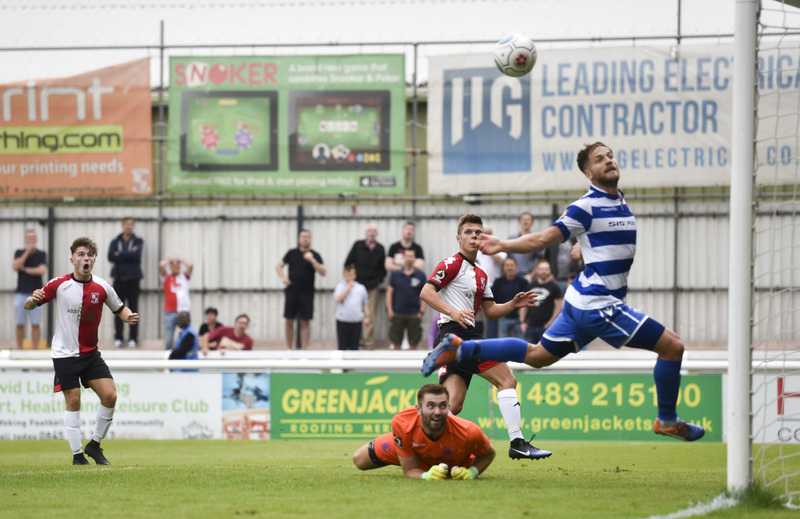 Woking started fairly brightly, without ever really imposing themselves on the visitors, who came into this match without a goal and with only a single point picked up from their opening two matches. Most of the enterprising play for the hosts came through Young, showing good trickery and quick feet enabling him to win a couple of free kicks from the left hand side. However it was Oxford who took the lead in the 17th minute. Jolley was muscled off the ball and Rob Sinclair played a through ball which bisected the Card’s centre back pairing finding Matt Paterson clear on the edge of the box. Schotterl got a touch to the ball with his left boot but couldn’t prevent it from looping into the net. The Cards struggled to get their passing game going, Hyde cutting an isolated figure up front and the visitors keeping Woking at arms-length, restricting Woking to speculative long balls and crosses from deep, which did not really threaten. Three minutes from the interval, Woking were handed a route back into the match as they sought to end the half with some of the momentum that was sadly missing for most of the opening period. Not for the first time in the half, Reggie Young was fouled on the left hand edge of the area, and, whilst Kretzschmar’s free kick was initially cleared, Luer’s cross struck the arm of Josh Ashby. The Kingfield Road End and Cards players appealed in unison, and the referee pointed to the spot. Kretzschmar, who successfully converted from 12 yards at East Thurrock, made no mistake, sending King the wrong way and firing into the centre of the goal. Neither manager made any changes at half time, although Dowson did send the Woking players out early for the second half, presumably following some strong words in the home dressing room. Despite this, again Woking struggled to find any fluency and tempo to their play in the opening stages after the break. Oxford had the first chance of the second period, Paterson’s right footed free kick well dealt with by Schotterl. At the other end, Young managed to skip clear of his full back and break promisingly down the left towards the box; unfortunately his pull back evaded the on-rushing Ferdinand and the visitors were able to clear. In the 55th minute Dowson made the first of two game-changing substitutions. Greg Luer, who had been starved of the ball, was replaced by Paul Hodges (pictured above, with Alan Dowson). Kretzschmar shifted to the right hand side, allowing Hodges to influence the game from a central position. 4 minutes later the Cards boss made a further change, Kiran Khinda-John replacing Jolley, with Collier stepping into midfield after the substitute slotted in at centre back. This move worked out well for Woking, Collier able to impose himself physically in the middle of midfield and provide a foothold from which to build attacks more easily. On the hour mark, the Cards took the lead. Jake Hyde held the ball up well, played in Hodges, who worked the ball left to Young. Young’s scuffed shot was met by the sliding Hyde from inside the six yard box. This was the definition of a poacher’s goal and the second of the season for the striker. Just two minutes later though, Woking gifted Oxford an equaliser. The home defence was caught napping from a short corner and Hyde rather desperately tripped his man. The referee, Mr Skipper, pointed to the spot for the second time. Paterson stepped up to bag a brace, making no mistake from the spot. The equaliser flattened the atmosphere around the ground, and Woking toiled to regain lost momentum. Oxford were perhaps fortunate in the 68th minute not to go down to ten men. Kabongo Tshimanga, on a yellow card through an earlier booking, fouled Casey, the referee opting not to dish out further punishment. However, in the 76th minute, Oxford did lose a player to a red card – former Woking loanee Ben Jefford sent off for a second booking for a foul on Hodges. 2 minutes later, the Cards made their numerical advantage count. A chipped ball over the top, looking for Hodges, saw the goalkeeper King rush out of his box. Whilst dealing with the initial danger, the keeper wasn’t able to clear convincingly. The ball fell to Hodges, then to Collier, with the crowd urging the Woking players to shoot with the keeper way out of his area. Collier showed composure to work the ball wide to the right to Kretzschmar, who floated a superb cross which the defender stretched to reach but could only divert to Hodges who slotted home into the empty net, to the delight of the home supporters. This was a special moment for the youngster, scoring his first goal for his boyhood club. Dowson made a final change in the 85th minute, Nicky Wheeler coming on to replace Reggie Young. Luke Ruddick was then shown two yellow cards in the space of a minute; a heavy challenge on Kretzschmar was followed shortly after by the centre back pulling Hyde down when he was through on goal. Oxford were forced to play with nine men for the remaining four minutes, plus five minutes of stoppage time. The Cards were comfortable in seeing the game out but, in truth, this was a somewhat disjointed performance in the main, with Alan Dowson making it plain in his post-match interviews that an improvement in performance will be needed in the Card’s next match, on Monday, at Wealdstone. Goals: Max Kretzschmar (pen) 42’, Jake Hyde 59’, Paul Hodges ’77.